In large non-aluminum saucepan whisk cider, salt and sugar to dissolve salt and sugar. Stir in iced water and rosemary. 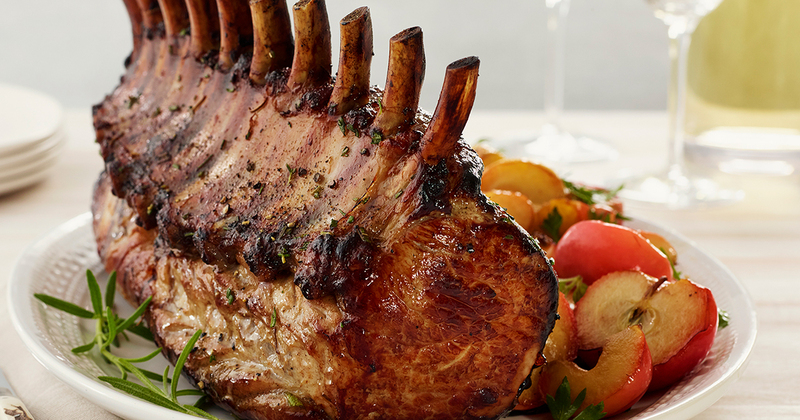 Add Open Prairie Natural pork loin roast to pot, meaty side down. Refrigerate for 4 to 6 hours. Preheat oven to 450ºF. Remove pork from brine; discard brine. Pat pork dry with paper towels. Tie roast crosswise with kitchen twine to hold its shape. Place pork, bone side down (no rack needed), in shallow roasting pan. Roast for 15 minutes. Reduce temperature to 350ºF. Roast until instant-read thermometer inserted in thickest part of roast not touching a bone reads 145ºF, about 1 hour. Transfer pork to chopping board and let stand for 15 minutes. Increase oven temperature to 425ºF. Pour out all but 1 tablespoon fat from pan. Add apples and jalapeño and stir to coat. Return to oven and roast until apples are barely tender, about 10 minutes. Remove from heat and stir in honey. Carve roast and serve with apples.